Youngsters Danny Graves, Carter Ros, David Ros and Brogran Ros head to Hailey Elementary School on Wednesday as part of Bike or Walk to School Day. Mountain Rides Transportation Authority sponsored the event and reported that 773 Blaine County students in grades K-8 participated in the program. Routes to School Coordinator Jim Finch said the county’s 36 percent participation rate was "awesome" and far exceeded a nationwide average of about 20 percent. 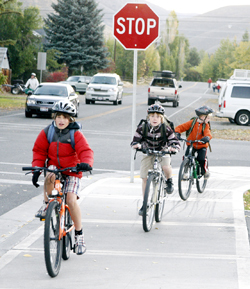 Bellevue Elementary School had the highest participation, with 48 percent of its students biking or walking to school. “It was an excellent turnout given a cold fall day, and we’re excited about the program,” he said. Nearly 5,000 schools participated nationwide. A crawl space was intended to increase the size of a home to 10,000 square feet.